LONG BEACH, California (14 February 2011) – Each year, CalSouth hosts a big event for coaches and players. Soccer Nation Expo has been shrinking over the past few years with fewer and fewer vendors. This year, even the Nike5 indoor tournament was missing. The one aspect that has continued to grow are charities. 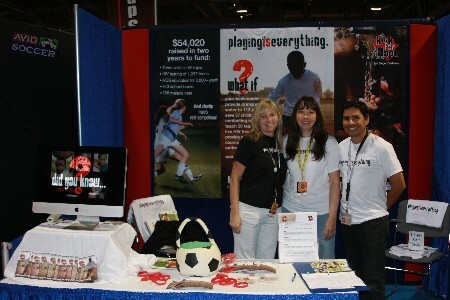 This year, there were three soccer related charities in addition to CalSouth and NSCAA. Returning with a bigger presents was Little Feet. They have a simple mission: give soccer balls to kids who cannot afford them. For every ball they sell, they give one away. In addition to the balls, they also sell coffee and t-shirts all to raise funds to bring gear to kids. Another child directed charity is Kick for Hope. Kick for hope raises money through soccer tournaments. To date they have built wells in Ethiopia, bought books and malaria nets and provided education on HIV. They have raised over $50,000. The next tournament is July 9-10 in San Diego. Finally, Kick for a Cure is another fund raiser. Kick for a Cure is raising money for Muscular Dystrophy through a tournament and festival. The tournament will be held June 18-19th in San Diego. The festival will include human foosball (demonstrated at Soccer Nation); carnival and sports related games; face painting and other events. 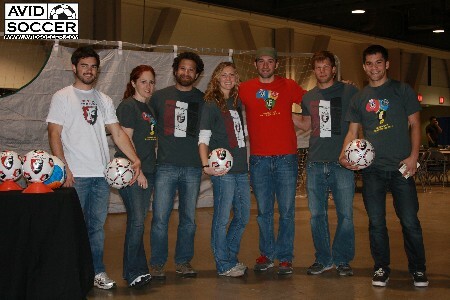 See more pictures from Soccer Nation Expo on the AVID Soccer Facebook page.